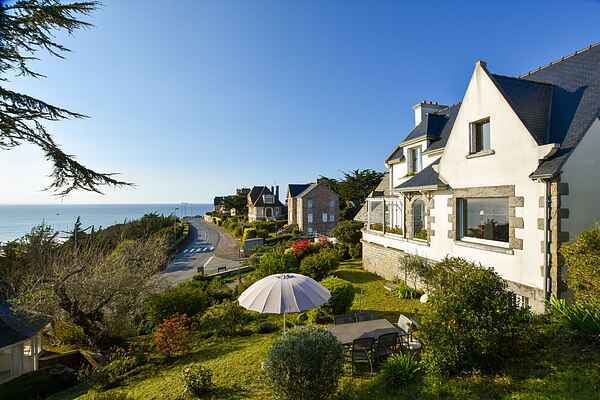 Your holiday home is located 200 m from the beach of Erquy and offers spectacular views of the coast and of the Baie de Saint Brieux! When the weather is fabulous enough, all you have to do is cross the coastal path to reach the beach. Is it less sunny? Don't worry, this house is lovely as it is for just staying in. Sit down at your verandah, read your book and simply enjoy the magnificent view. The centre of Erquy is 800 m away, you will find a bakery, supermarket, post office and some nice restaurants here. Of course the menus will offer the famous coquilles St. Jacques (scallops), for Erquy is known as the 'capitale de St. Jacques'! Pass by the fish auction or take a boat trip to the 'Ile de Bréhat'. Would you like to go back in time? Then do visit beautiful 15th century Château de Bienassis (5 km) or the impressive fort La Latte (15 km), built on a rock, near Cap Fréhel (12 km). The Breton towns of Saint-Malo and Dinan (both at 40 km) are also worth a visit. You will find golf courses in Val André (10 km) and Sables d'Or les Pins (7 km).